In this Interview with Jean-Francois Perreault of Branchez-vous! I talk about romances on the internet. * What factors lead someone to a cyber-romance? Is it the exotic quality of it? The "exotic" quality of a cyber-romances might be one factor that attracts some people. Using computers is a relatively new way to have an intimate relationship with someone. Because it occurs through this seemingly powerful and mysterious thing call the "internet" or "cyberspace", it may feel exciting to some people. The lover's presence enters your home (or office) without the person physically being there, which feels very magical. On a more down-to-earth level, people are drawn to cyber-romances for the same reasons they are drawn to "face-to-face" romances - either they don't have a "real-life" love relationship, or there is something missing in their "real-life" love relationship. On the internet, they may indeed find what they are missing. Or, because of the partial anonymity of cyberspace, which allows lots of room for fantasy and imagination, they may THINK they have found what they are missing. * When the feelings are mutual, is the cyber-romance a true relationship? What about when they actually meet each other? Cyber-romances can indeed be "true" (genuine) relationships. A great deal of intimacy is possible simply by communicating with someone through typed text. Some people believe that they are more directly encountering the mind, heart, and even soul of the other person when they are not being distracted or mislead by the physical appearance of the person, as in "real life." Of course, there is also much to be learned about someone by being with them physically. Physical presence is an important dimension of communication and intimacy. This is why most people who fall in love on the internet eventually feel that they MUST meet the person. Physical contact is a basic human need, a basic element of human intimacy. You can't hold your lover in cyberspace. * As relationships with strangers increase because of the internet, do you think that Platonic loves are going to increase? I'm not entirely sure what a "Platonic" love is. If it means "friendship" as compared to a romantic/sexual relationship, then I'd say yes. I guess that in a Platonic love you are attracted primarily to someone's MIND. In cyberspace, most of the time all you really experience is the other person's mind, and not their physical qualities. So perhaps Platonic loves are more likely to occur. * What are the psychological dangers or side effects of a cyber-romance? Is there a dependency on it, or a loss of a sense of reality, or a loss of connection with people in real life? Or is there no danger because it's simply a new way to interact with people? 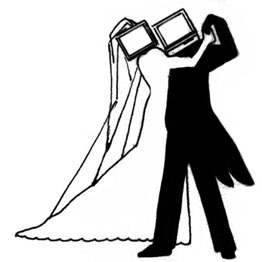 My guess is that in a "true" romance on the internet, the couple eventually will want to meet each other face-to-face. They may HAVE to meet each other for the relationship to fully develop and to be fully satisfying. For these people, the internet simply was a way to meet each other. I say "simply" but this feature of the internet shouldn't be underestimated. It is a POWERFUL way for people with compatible interests and personalities to find each other. There are some people who may NOT want to meet the lover face-to-face. My guess is that these people prefer living with the fantasy that they have created (consciously or unconsciously) about the cyber-lover. The couple may be collaborating in the creation of a mutually satisfying fantasy that portrays themselves in ways very different from how they truly are in reality. They may not want to meet each other face-to-face because the fantasy might be destroyed by the hard facts of reality. Who can say whether this is "wrong" or "dangerous?" Many people allow themselves the luxury of fantasy - either through books, or TV, or movies. And most people don't confuse this fantasy with reality. A cyber-lover is just another type of "escape fantasy" - only it's much more interactive, and therefore much more exciting, than the more usual methods. * What changes do you predict in cyberspace relationships in the next century? I think the internet is having a major impact on how people will relate to each other. As I see it, cyberspace relationships will evolve in two distinct directions. The first will be more sophisticated imitations of "real-life" interactions involving video and audio technology. Through the computer, you will see and hear the other person almost as if they are in the room with you. In the second, and more fascinating scenario, people will interact with each other in more sophisticated imaginary worlds and with imaginary identities. Think of the "holodecks" of Star Trek and you will see where this direction might take us. We might think of these alternative styles of interacting with others as entertainment - but using "fantasy" to discover new dimensions of ourselves and how we relate to others can be very powerful. So it may be much more than just a game.